Financial planning isn’t something that has to be a routine, or boring chore. Aspire Planning was established to flip financial advice from the old mantra of “robotic” financial strategies, and their new website was created to reflect this motto. First Time Websites? Not so scary after all! For people who have never thought about it before, corporate website design can sound like a big and daunting task. Because after all, a website is the online storefront for your business, and how you present your business online matters. A company that doesn’t have an online presence (or a company with an outdated presence) will probably need to evaluate the missed opportunity cost at some stage. Imagine all of the extra business and revenue you could be missing out on! Or worse, imagine all of the people who don’t even know that you exist?! 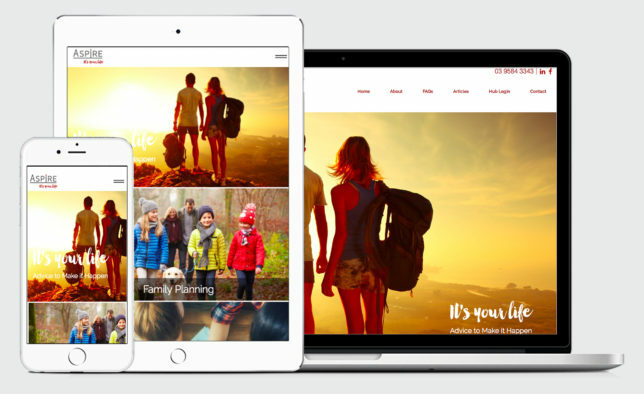 The great news is that with Webtron, we make planning your corporate website as easy as pie! No one knows your business better than you. At Webtron, we host comprehensive website planning sessions where all you have to do is tell us about your business and what you’d like out of your corporate website. This ensures that nothing is missed when it comes to creating a website that reflects your business. Unlike most web designers, we speak your language when it comes to business. This enables us to translate that knowledge into a workable, strategic website design that ultimately reflects the core of your business and its main goals, just like we’ve done for Aspire. Webtron has been referred to as the secret weapon behind many well-known businesses. With Webtron’s guidance, corporate websites aren’t so scary after all. Check out the NEW Aspire Planning website here or get in contact with the Web Designers behind it all! Contact Webtron on 1300 932 876 to book your comprehensive website planning session!